I make! 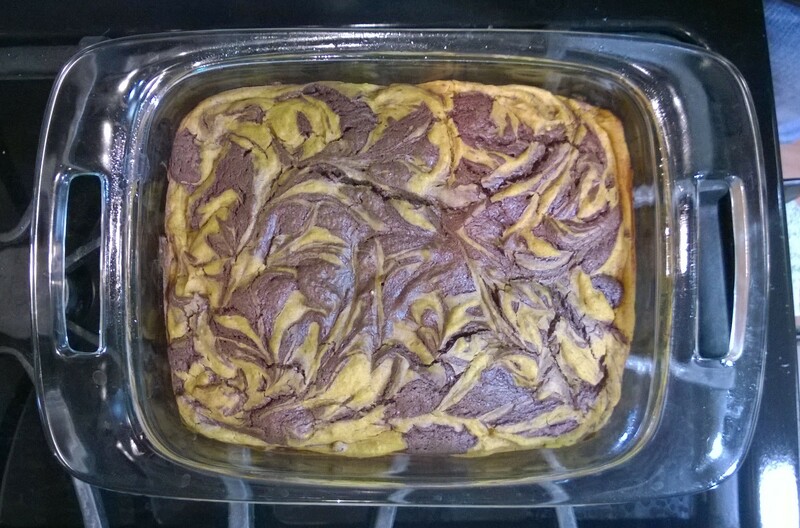 Pumpkin swirl brownies edition | Random moosages as I see fit. It’s the season for pumpkin related things right? Actually, the season for pumpkin spice everything began awhile ago. I just haven’t had lots of people clamoring for pumpkin related things this year so I haven’t made any. But anyway, I saw a recipe for these brownies awhile ago and I decided to give them a try as a Friday night activity. 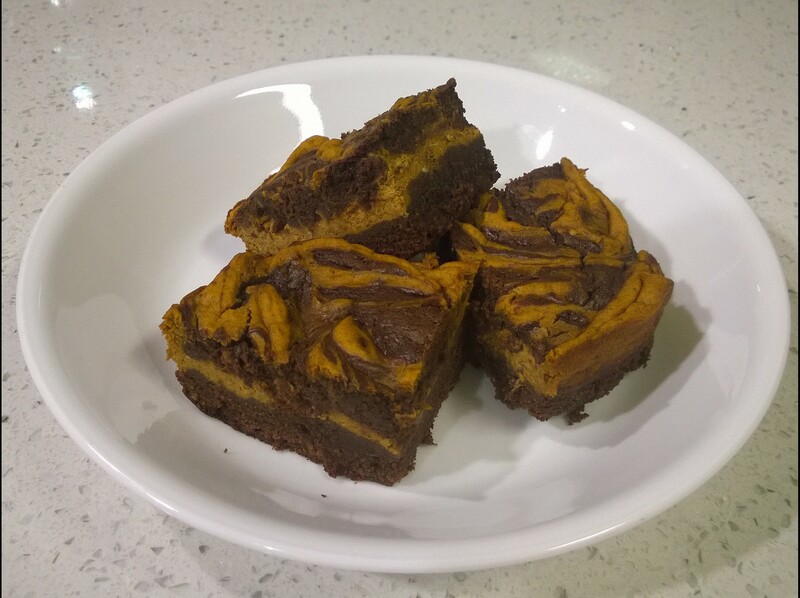 The brownies made as-is aren’t bad at all. They had a nice chocolate flavor with a hint of pumpkin and spice. I would have preferred more pumpkin and spice and highlighted the pumpkinness of the brownies…because they’re not your normal brownie. In the end, I did change up the recipe because 1) I didn’t want to make a 9×13 pan of brownies every time, 2) I think the pumpkin:brownie ratio could have been bigger, 3) I normally have semi-sweet chocolate on hand but not bittersweet, and 4) I almost never have all spice. Preheat oven to 350deg F.
Prep 7×11 pan. Spray, butter, oil, flour, parchment, whatever. In a large bowl, combine melted butter and chocolate chips. Stir until smooth. Add 0.5 cup sugar, 2 eggs, vanilla. Stir until combined. Sift in baking powder, cocoa powder, flour, and salt. Stir until combined. In a separate bowl, combine cream cheese, pumpkin, 1 egg, 1 tbsp sugar. Stir until incorporated. Sift in cinnamon, cloves, and nutmeg. Stir until combined. Pour about 0.75 of the brownie batter into the baking dish and spread evenly. Pour the pumpkin mixture on top of the brownie batter and spread evenly. Drop spoonfuls of the remaining brownie batter on top of the pumpkin mixture and swirl through the batters with a knife. Bake for about 50 min or until a toothpick inserted into the center just comes out clean. Use whatever spices you like with your pumpkin. I’m always a fan of cinnamon. You could use a pumpkin pie spice mix too if you wanted. Double the recipe to make a 9×13 pan of brownies. I would probably also add chopped walnuts if allergies were not a concern.